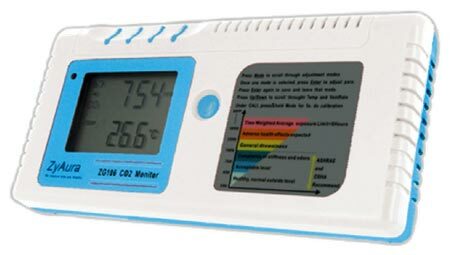 ZG-106 CO2 Monitor is a low-cost, portable, accurate hand-held Co2 Monitor with LCD display, which can be put on desktop also to monitor CO2 concentration, ambient atmosphere and efficiency of air ventilation in offices, public buildings, commercial centres and other locations where indoor air quality is important. ZG-106 uses NDIR technology to improve the long-term stability. It has several built-in modes to help one understand the ambient air quality. Today, we are counted among the major Carbon Dioxide Monitor Manufacturers and CO2 Gas Monitor Suppliers in India. Applications : Offices, Hospitals, Hotels, Shoping Malls, theatres, Fitness Centers, Public Transport Stations, Exhibition Halls, Food Processing & Farming, Greenhouses, Underground Construction, Winyards etc.